Mark di Suvero, Yoga, 1991. I can think of no more fitting a place for a sculpture entitled “Yoga” (1991) than Brooklyn, a borough that does its fair share of the meditative art. 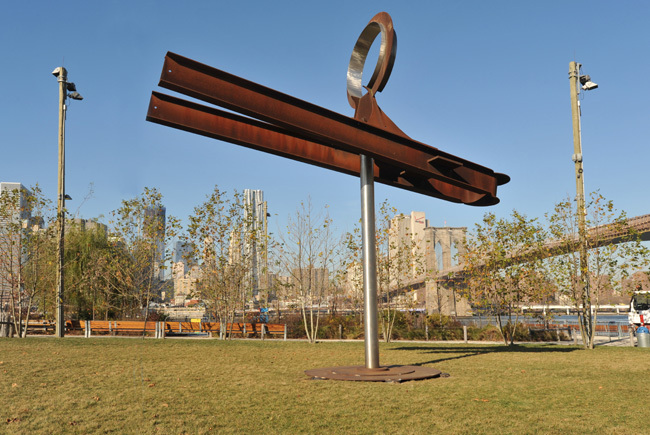 The 30-foot-tall piece by American sculptor Mark di Suvero—an I-beam bent in half to look a bit like a flying “u” that rocks and pivots on a pole–sits on the Bridge View Lawn at Brooklyn Bridge Park’s Pier 1, overlooking the East River. The work is topped with an “o” shape. The installation will remain for a year and was organized and implemented by Storm King Art Center, Brooklyn Bridge Park and The Brooklyn Bridge Park and made possible by support of Jennifer and Malcolm Nolen and other donors.